Description A rich, visual storytelling format. See AMP By Example&apos;s Hello World sample. Learn from the Create a visual AMP story tutorial. This component is experimental and under active development. For any issues, please file a GitHub issue. 1.0 Current version, since 2018-07-16. As of 2018-07-16, version 0.1 is considered deprecated, and will be removed on 2019-03-19. This may cause minor breaking changes, as your stories will automatically be upgraded to use version 1.0. We recommend manually migrating your pages to version 1.0 before this date to ensure functionality and proper design. Share providers are sorted according to the JSON configuration. Learn more about the new components and how to specify them in the JSON configuration in the amp-story-bookend section. We&apos;ve added new metadata attributes to the <amp-story> element. These metadata attributes will be used for displaying a preview of the story across the AMP stories ecosystem. For example, these attributes can be used to render an engaging preview link in the bookend of a related story. Providing these attributes will also help ensure your story is future-proof for rich, embedded experiences in AMP stories surfaces to come. Note that these metadata attributes supplement and do not replace any Structured Data (e.g. JSON-LD) on the page. We still recommend adding Structured Data to all your AMP pages, including AMP stories. title [required] The title of the story. publisher [required] The name of the story&apos;s publisher. publisher-logo-src [required] The publisher&apos;s logo in square format (1x1 aspect ratio). poster-portrait-src [required] The story poster in portrait format (3x4 aspect ratio). poster-square-src The story poster in square format (1x1 aspect ratio). poster-landscape-src The story poster in landscape format (4x3 aspect ratio). The file should be a raster file, such as .jpg, .png, or .gif. Avoid vector files, such as .svg or .eps. Avoid animated images, such as animated gifs. The logo shape should be a square, not a rectangle. 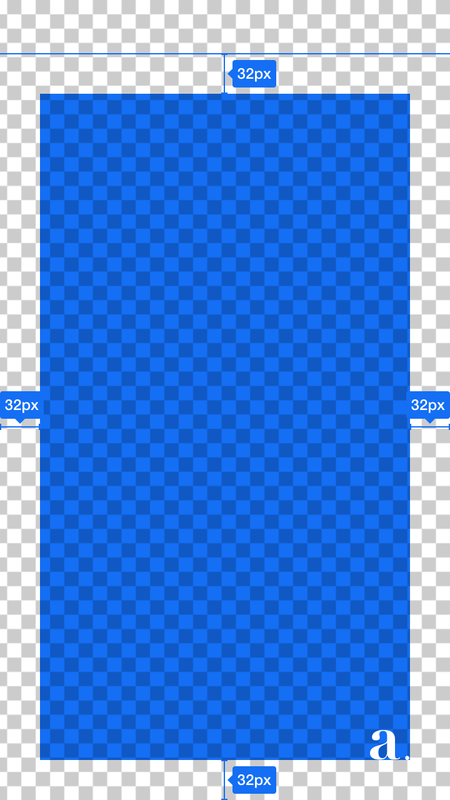 The background color should not be transparent. Use one logo per brand that is consistent across AMP stories. The logo should be at least 96x96 pixels. The poster image should be representative of the entire AMP story. The poster image should be visible to the user when the user begins the AMP story. However, the image file URL used in the metadata does not have to match exactly the URL used on the first page of the story. The URL used in the metadata can include sizing, cropping, or minor styling changes for the preview purpose. The poster image should be a raster file, such as .jpg, .png, or .gif. Avoid vector files, such as .svg or .eps. The poster image should be in 3x4 aspect ratio for portrait, 4x3 for landscape, and 1x1 for square. If the poster image is derived from a frame in a video, the thumbnail should be representative of the video. For example, the first frame in a video is often not representative. The amp-story extension provides a new format for displaying visual content that you can assemble into a story-telling experience. With an AMP story, you can provide users with bite-sized, visually rich information and content. An AMP story is a complete AMP HTML document that is comprised of pages, within the pages are layers, within the layers are AMP & HTML elements, like media, analytics, text, and so on. The following markup is a decent starting point or boilerplate. Copy this and save it to a file with a .html extension. The content in the body creates a story with two pages. 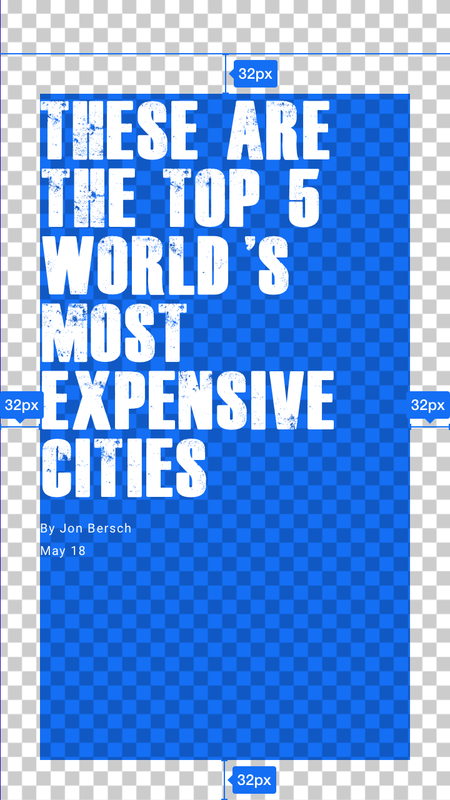 Each page has a full bleed background image, with a simple string of text on top of it. The <amp-story standalone> element is the only child element of <body>. Identifies that the document is an AMP story. Contain a <script async src="https://cdn.ampproject.org/v0/amp-story-1.0.js" custom-element="amp-story"></script> tag as the third child of the <head> tag. Includes and loads the amp-story JS library. Contain a <link rel="canonical" href="$STORY_URL"> tag inside the <head>. The link points to the story itself, identifying the story as the canonical document. The amp-story component represents an entire story. The component itself implements the UI shell, including handling gestures and navigation, and inserting the application shell UI (controls, progress bar, etc). Identifies that the AMP document is a story. The name of the story&apos;s publisher. A URL to the story publisher&apos;s logo in square format (1x1 aspect ratio). For example publisher-logo-src="https://example.com/logo/1x1.png", where 1x1.png is a 36x36 px logo. A URL to the story poster in portrait format (3x4 aspect ratio). Enables landscape orientation support on mobile devices and a full bleed landscape experience on desktop devices. A URL to an audio file that plays throughout the story. A URL to the story poster in square format (1x1 aspect ratio). A URL to the story poster in landscape format (4x3 aspect ratio). A "poster" is an image that displays in the UI until your story is loaded. The poster can generally be the first screen of your story, although you can use any image that is representative of the story. Allow the story to be seen when a mobile device is held in a landscape orientation. Change the desktop experience to an immersive full bleed mode, replacing the default three portrait panels experience. The <amp-story> component contains one or more <amp-story-page> components, containing each of the individual screens of the story. The first page specified in the document order is the first page shown in the story. The <amp-story-page> component represents the content to display on a single page of a story. A unique identifier for the page. Can be used for styling the page and its descendants in CSS, and is also used to uniquely identify the page in the URL fragment. A URI to an audio file that plays while this page is in view. The <amp-story-page> component contains one or more layers. Layers are stacked bottom-up (the first layer specified in the DOM is at the bottom; the last layer specified in the DOM is at the top). Layers are stacked on top of one another to create the desired visual effect. The <amp-story-grid-layer> component lays its children out into a grid. Its implementation is based off of the CSS Grid Spec. The template attribute determines the layout of the grid layer. Available templates are described in the Templates section below. This attribute is specified on children of <amp-story-grid-layer>. grid-area specifies the named area (from using a template that defines them) in which the element containing this attribute should appear. The following are available templates to specify for the layout of the grid layer. To see the layout templates in use, check out the layouts demo on AMP By Example. The fill template shows its first child full bleed. All other children are not shown. The vertical template lays its elements out along the y-axis. By default, its elements are aligned to the top, and can take up the entirety of the screen along the x-axis. The horizontal template lays its elements out along the x-axis. By default, its elements are aligned to the start of the line and can take up the entirety of the screen along the y-axis. The thirds template divides the screen into three equally-sized rows, and allows you to slot content into each area. Note: This list will be expanded over time. We support inline links <a> as a descendant of amp-story-grid-layer. Whenever a link is tapped a tooltip will be shown - deferring the corresponding action until the user taps again in the tooltip. You can customize the contents of the tooltip displayed on top of a user interactive element by specifying the following attributes. If they are not specified, a fallback value will be provided automatically. Takes in a src where the icon image is located. A string that will be shown when the tooltip appears. The <amp-story-cta-layer> component allows the usage of <a> and <button> elements inside an <amp-story-page>. 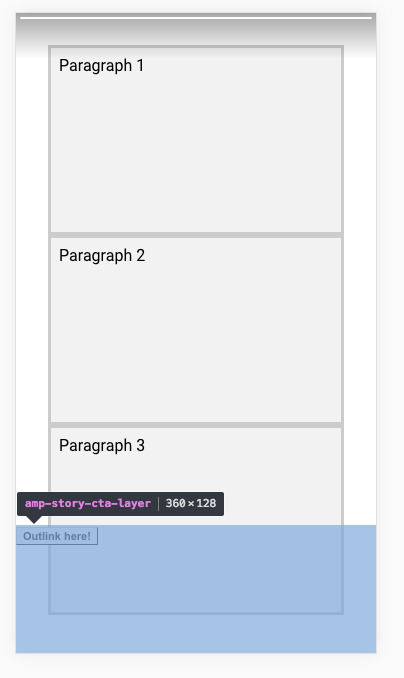 If specified, the <amp-story-cta-layer> element must be the last layer within an <amp-story-page>. As a result, effectively every <amp-story-page> can have exactly one or exactly zero of the <amp-story-cta-layer> element. Positioning and sizing of this layer cannot be controlled. It is always 100% width of the page, 20% height of the page, and aligned to the bottom of the page. The amp-story-cta-layer allows mostly the same descendants as amp-story-grid-layer, and additionally allows <a> and <button> tags. For an updated list of supported children, be sure to take a look at the amp-story-cta-layer-allowed-descendants field in the validation rules. Attach additional content to a story page! Story page attachments allow you to provide additional AMPHTML content to specific pages. This content can be revealed by users through a "swipe up" gesture, or a tap on the call to action element. A UI prompt to open the attachment will automatically be added at the bottom of every page that configured an attachment. The <amp-story-page-attachment> element must be the last child of <amp-story-page>, and must have the layout="nodisplay" attribute. The attachment AMPHTML content is expected to be provided inline in your AMP Story, within this <amp-story-page-attachment> tag. Story page attachments allow the same HTML elements as AMP Story along with additional components listed below, such as third party video players or social media embeds. This means you can add additional content that is too verbose or disallowed in an AMP Story page. Every element inside an <amp-story-page> can have an entrance animation. You can configure animations by specifying a set of animation attributes on the element; no additional AMP extensions or configuration is needed. See a live demo of all the AMP story animations on AMP By Example. Use this attribute to specify the name of the entrance animation preset. Example: A heading flies in from left of the page. Use this attribute to specify the duration of the entrance animation, in seconds or milliseconds (e.g., 0.2s or 200ms). The default duration depends on the animation preset you specified. Example: A heading flies in from left of the page and the animation finishes within half a second. Use this attribute to specify the delay before starting the animation. The value must be greater than or equal to 0, in seconds or milliseconds (for example, 0.2s or 200ms). The default delay depends on the animation preset you specified. Example: After 0.4 seconds, a heading flies in from the left of the page and completes its entrance within 0.5 seconds. The animation delay is not guaranteed to be exact. Additional delays can be caused by loading the amp-animation extension in the background when the first animated element has been scanned. The attribute contract is defined as delay this animation for at least N milliseconds. This applies to all elements including those with a delay of 0 seconds. Use this attribute to chain or sequence animations (for example, animation2 starts after animation1 is complete). Specify the ID of the animated element that this element&apos;s animation will follow. The element must be present on the same <amp-story-page>. The delay is applied after the previous element&apos;s animation has finished. For further details, see the Sequencing animations section below. Use these two attributes to further specify the parameters of your zoom-in and zoom-out animations. The value must be greater than or equal to 0, and decimals are allowed. The default will be scale-start: 1 and scale-start: 3 for zoom-in, and the inverse for zoom-out. Example: An image zooming-in from 2x to 5x its size over 4 seconds. Use this attribute to specify the horizontal panning of your image in a pan-left/pan-right animation. The value must be greater than or equal to 0 in pixels. The default value will pan the whole width of the specified image. Example: An image panning 200px to the left over 10 seconds. Use this attribute to specify the vertical panning of your image in a pan-up/pan-down animation. The value must be greater than or equal to 0 in pixels. The default value will pan the whole height of the specified image. Example: An image panning 50px down over 15 seconds. To chain animations in sequence, use the animate-in-after attribute. All elements in a given chain must be present in the same <amp-story-page>. Elements without the animate-in-after attribute do not belong to a sequence chain, and will start independently on page entrance. You can apply multiple entrance animations on one element (for example, an element flies into the page and fades in at the same time). It&apos;s not possible to assign more than one animation preset to a single element; however, elements with different entrance animations can be nested to combine them into one. I will fly-in and fade-in! If a composed animation is supposed to start after the end of a separate element&apos;s animation, make sure that all nested elements that compose the animation have the attribute animate-in-after set to the same id. The amp-story-bookend is the last screen of the story. It contains related links, sharing options, call to action links, and more. To use it, include an <amp-story-bookend> tag as the child of your <amp-story> with the required attribute layout=nodisplay. You can then specify the JSON configuration in a separate file and import it through the src attribute, or you can place it inline. It is required to specify you are using the v1.0 version by including the first line. The bookend is made up of a variety of components. These components can be articles, call to action links, text, and more. They are specified in the components field of the configured JSON. See the Example JSON response section below for an example. The heading component has a text field, which can be used to append a title to a group of articles. The small component can be used to link to related articles. This component requires the following fields: title, url, and optionally an image. The landscape component can be used for alternative formats of content, like videos. This component requires the following fields: title, url, and image. Optionally, you can add a category field, which displays a subheading above the title. The portrait component can be used to link to other stories. This component requires the following fields: title, url, and image. Optionally, you can add a category field, which displays a subheading above the title. The cta-link component lets you specify links for call to actions (e.g., Read More or Subscribe). This component has a links key, which specifies an array of links. Each link is an object with a text and url values. The textbox component lets you specify text inside the bookend (for example, photo credits). This component requires a text array, where each element of the array is a line of text. The configuration for social sharing is defined in the shareProviders field of the response object, and it&apos;s optional. This field should contain a string, where each string respresents a share provider&apos;s name (e.g. twitter). When extra parameters are required, an object with key-value pairs should be used. The object should contain a key provider with a value (e.g. facebook) corresponding to the provider&apos;s name. The next key-values will depend on the share provider. The list of available providers is the same as in the amp-social-share component. Each of these providers has a different set of available parameters (see data-param-*). The configuration object takes these parameters without the data-param- prefix (for example, the data-param-app_id would appear in the configuration object as app_id). The <amp-story-bookend> must have a src attribute pointing to the JSON configuration of the bookend. It is described as a URL endpoint that accepts GET requests and returns a JSON response with the contents of the bookend. If omitted, the amp-story component renders a default UI for the end screen. The system is responsible for fetching the data necessary to render related and trending articles. This can be served from a static JSON file, or dynamically-generated (e.g., to calculate what is currently trending). // You must specify version v1.0. // You can add custom sharing parameters depending on the social platform. The following are other components usable in AMP stories that require some story-specific caveats. For more generally usable components see the list of allowed children. See amp-story rules in the AMP validator specification. Additionally, for right-to-left languages, you may include the dir="rtl" attribute on the <html> tag of your story. This may be used in conjunction with the language code as well, e.g. <html ⚡ lang="ar" dir="rtl">.